The beautiful blue patina coating the blue-death feigning beetle is a layer of wax that helps the beetle avoid desiccation. During the past weeks we discovered clever defenses of two formidable walking sticks, the twostriped and Macleay’s spectre, that combined behavior, body form, armament, and chemistry to foil attack by predators. This week we continue our travels to warmer realms and visit blue death-feigning beetles, denizens of deserts, to learn their clever strategies to survive predators and the brutal aridity of some of the most hostile environments on the planet. In a typical year the Mojave Desert receives about five inches of rainfall. This presents an enormous challenge not only for indigenous plants but also for animals that call this land home. Due to the relationship between surface area and volume, tiny creatures like insects face a colossal challenge to conserve water, especially in arid environments. 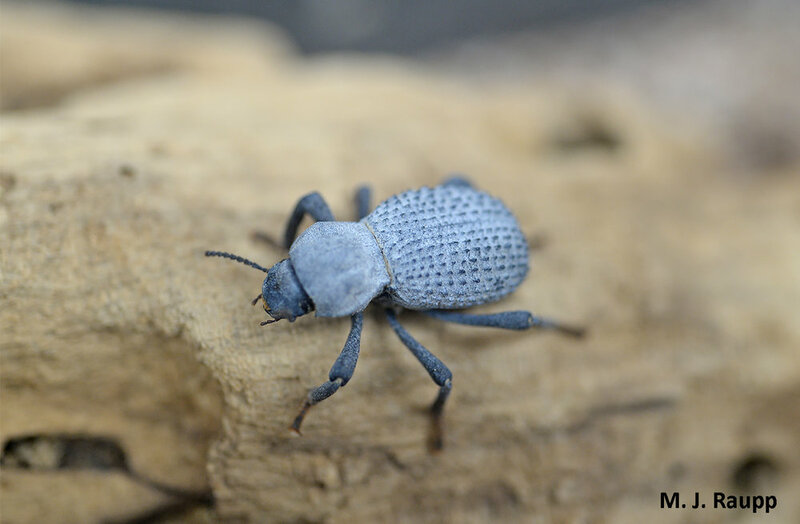 The reason the blue death-feigning beetle is steely blue stems from the deposition of a rather heavy coating of wax secreted by specialized glands just beneath the surface of the beetle’s exoskeleton. In the same way that good old wax paper prevented your peanut butter and jelly sandwich from drying out before lunch, this wax coating greatly reduces moisture loss through the cuticle of the insect, thereby helping it conserve precious water obtained from food or substrates in the environment. Low humidity and wicked heat are not the only challenges faced by small insects in the desert. The hungry jaws and beaks of feathered and unfeathered reptiles are a present danger, as lizards and birds search for small morsels of food scurrying across the sand. In a habitat where cover may be scarce, what should you do when confronted by an attacker? Well, this depends who the attacker is. In the case of humans versus grizzly bears, the National Park Service recommends laying face-down on the ground and playing dead. The practice of playing dead is called thanatosis and it is used not only by humans to avoid being eaten by grizzlies but also by some reptiles, frogs, snakes, fish, and of course marsupials like the opossum. You’ve no doubt heard of playing possum. Well, many insects drop from vegetation when disturbed and remain motionless on the ground for long periods of time. This faking-death behavior may send a confusing signal to a predator that this potential food item does not behave like a “normal” food item and it may not be something to eat. When not playing dead, the blue death-feigning beetle ambles about its Zoo habitat looking for a free lunch. In the case of insects that drop from plants, remaining motionless on the ground can make it difficult for motion-exploiting predators to locate their prey when it blends with earthen substrates. 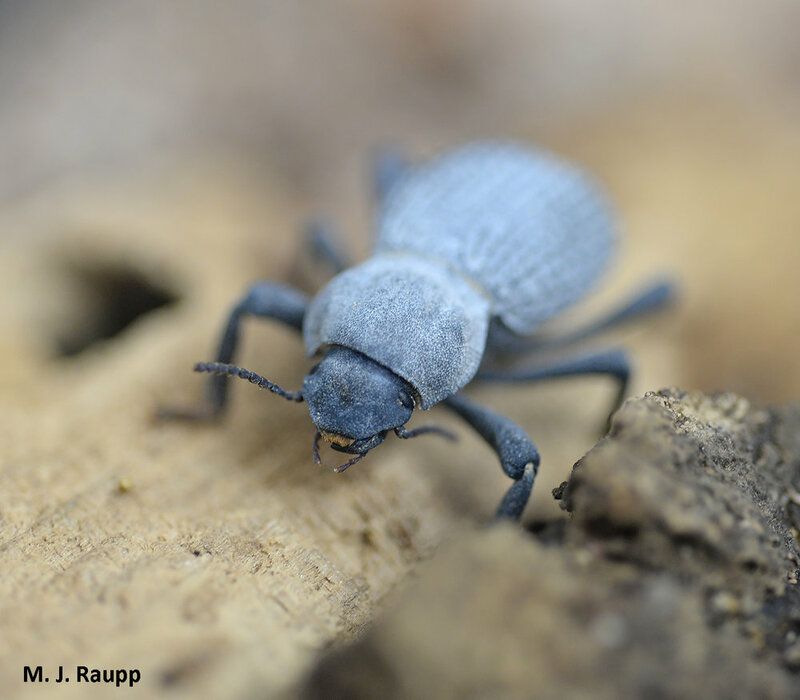 As you watch the video of one blue death-feigning beetle, a member of our insect zoo, you will see it lying motionless on its back, legs in the air, for several seconds after being harassed. One reference reported that beetles might fake-death for many minutes or even hours when threatened. In the case of our zoo beetles, prodding fingers are a regular event and their death ruse is usually short-lived. With plenty of water and food and an absence of serious predators, our colony of blue death-feigning beetles seem to have more important ways to spend their time. But in the Mojave Desert and other arid locals in southern North America, playing dead may prevent being dead. Information for this week’s episode comes from the handy “Insect Identification” website at https://www.insectidentification.org/insect-description.asp?identification=Blue-Death-Feigning-Beetle and “Insect Behavior: From Mechanisms to Ecological and Evolutionary Consequences“ by Alex Cordoba-Aguilar, Daniel Gonzalez-Tokman, and Isaac Gonzalez-Santoyo. Thanks To Chris Sargent and Todd Waters for keeping our arthropods happy and thriving in the University of Maryland’s Insect Zoo.